I love the World Fantasy Convention. The 2010 World Fantasy in Columbus was the first big SF/F convention I ever attended. In addition to meeting lots of fellow authors and editors, I was even picked to be a participating author on some really exciting panels. In general I had a fantasy-themed ball. So imagine my excitement when I learned World Fantasy was returning to Columbus in 2016. I planned to register early and be all up in that convention. Except I still haven't registered, and now I'm ticked. You see, I support both John Scalzi's convention harassment policy pledge and Mary Robinette Kowal's accessibility policy pledge. Basically, these pledges mean that I won't attend a convention which doesn't have clear and enforceable policies dealing with both of these issues. 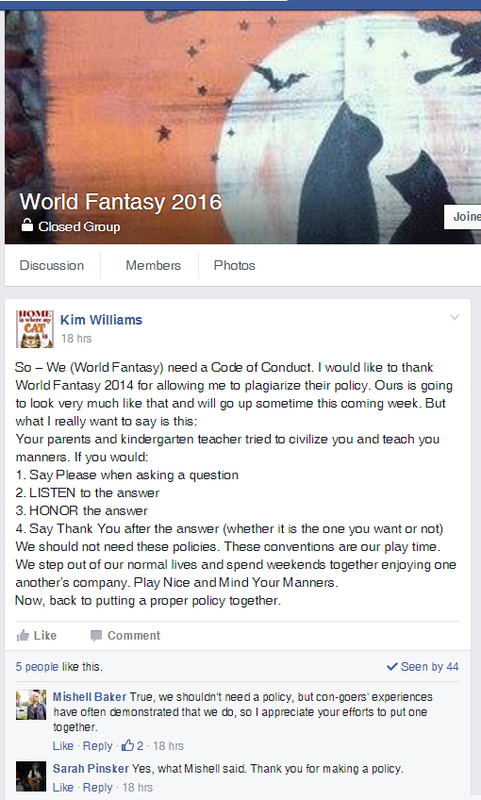 As of February 1st, WFC2016 has yet to post either of these policies. Today's date matters because on January 31 at 11:59 pm the price to register jumped from $150 to $225. I wanted to register at that lower price but without the policies I wouldn't do so (I'd also have liked to known the guests of honor, but I can live without that). Let me be very clear: It is wrong for a convention to accept registration payments before that convention posts their harassment and accessibility policies. It is even more wrong to belittle these policies and those requesting them. I mean, seriously, did people learn nothing from the debacle around last year's World Fantasy Convention fail on harassment? See below for a selection of these screengrabs. I'm guessing that by posting these screengrabs I won't be invited to WFC 2016 as a participating author. And that's fine with me, especially if anything I've revealed pushes World Fantasy to finally fix their continual lack of respect and attention around these issues. I've also heard a rumor that WFC 2018 in Baltimore already has their harassment and accessibility policies. If so, that's how a big con like World Fantasy should be run.